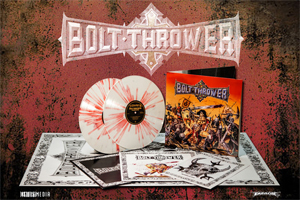 BOLT THROWER War Master is now available as a limited edition 2LP at CM Distro. Pressed in a double gatefold format, this special War Master re-issue features 3 sides of "blood-drenched" hymns on red/silver splattered white wax with side 4 being an exclusive etching. The packaging also includes: (1) an 8-page booklet, (2) a collectible 24x36 fold-out poster, and (3) 2 printed LP jackets. "Intro ... Unleashed (Upon Mankind)"